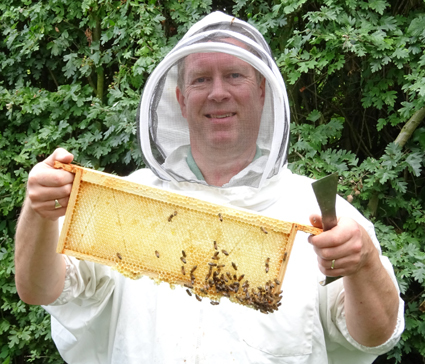 Learn at your own speed how to handle bees, or make a piece of ironwork on my outdoor forge. I don’t mix groups, so you will have the time to yourself. If you pay for one person then it will be exactly that, just you, with my full attention. I am fully insured and have all the protective equipment you will need. I also have NQA Level 2 award in emergency first aid at work. Beekeeping: approximately 4 hours for 1 £80, for two £110 and for 3 £135. 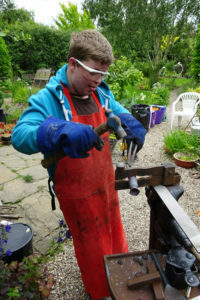 Blacksmithing: for 1 person £155 (10am to 4pm, or a little later if we need). 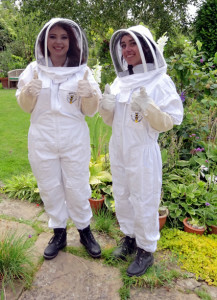 For 2 people £220 total, including materials for a medium sized piece each. No one has ever failed to go home with a finished piece, a smile on their face and coal dust in crevices you had forgotten you had. Children under 16 must be accompanied by a participating adult. For the blacksmith experience I ask that you bring your own lunch so that I can concentrate on our forge time, but I do have tea, coffee and biscuits on tap. Please contact me to have a chat about what you would like to do or learn more about. You can also read my terms and conditions here. 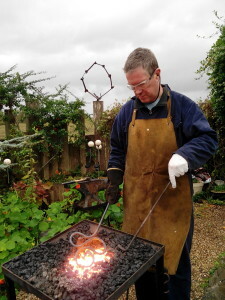 My forge is outside so in the unlikely event that rain stops play on the date we have booked for your experience day, then we will reschedule to a day that works for you. The experience days are held on weekdays, Tuesday to Friday. If you are buying the day as a present I can supply a ‘gift card’ for you to print. To maintain the surprise, we can then set the date that works for both of us after the gift giving. Experience days can be taken on a mutually agreed date within 12 months of purchase.